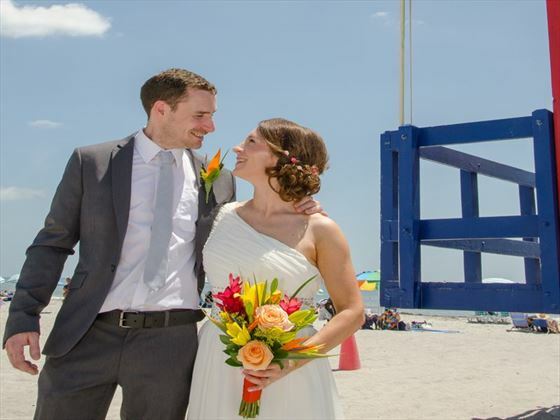 The stunningly beautiful white sand of Cocoa Beach makes the perfect romantic location for an amazing wedding day in Florida. Are you looking for a basic - not to many frills beach wedding? 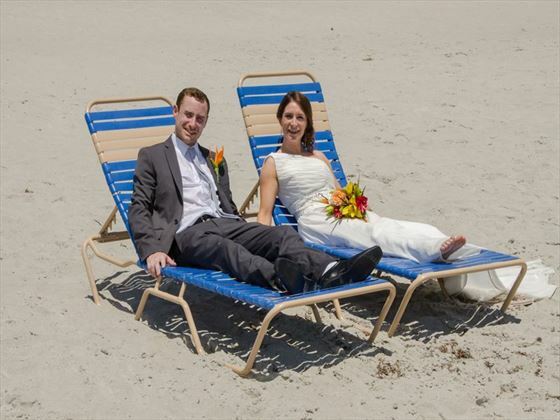 Then our Cocoa Beach weddings might be for you. 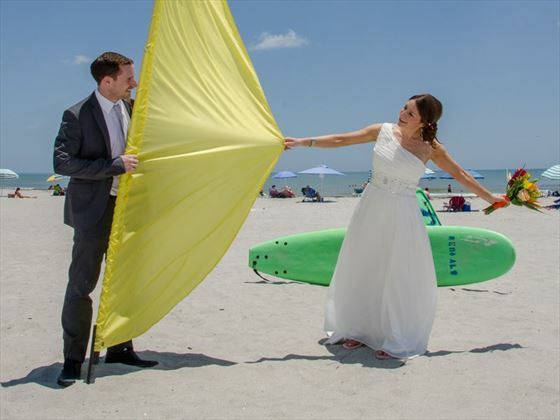 The jewel of Florida's Space Coast, Cocoa Beach is offers truly stunning white sand - and that makes it a wonderful destination for a wedding day that you'll never forget. 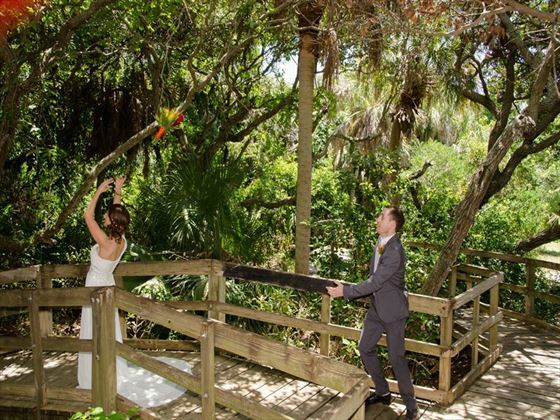 One of our favourite ceremony sites in Cocoa Beach is Lori Wilson Park. It’s a natural strip of beach with beautiful sand dunes, ocean view boardwalks and sea oats. And, of course, the ocean view is beautiful! You can have your ceremony on the sand by the dunes or water, on the boardwalk overlooking the beach or in a lovely & serene wooded nature trail on a wedding deck. Weddings are performed Monday to Thursday 11am - 3pm ( Nov - Apr) 10am - Noon and 4pm and later (May - October). Weddings are not offered in July orAugust due to the heat. Approximate driving times - 1 hour from International Drive, 1 1/2 hour from Lake Buena Vista Area and 2 hours from the Kissimmee/Hwy 27 areas. Application and Fee - As a couple you now have the choice of courthouses to apply for your marriage licence in person Orange County, Osceola and Lake Country. Applications are accepted between 8am – 4pm Monday to Friday, except for Bank Holidays. For Non-Florida residents, you now have the option to arrange your Marriage Licence by Mail, prior to your arrival in Florida. This will save you time and worry. You do not need to be a resident of Florida to apply for a marriage licence. No minimum residency applies to overseas couples. As a couple you now have the choice of three courthouses to apply for your marriage licence in person Orange County, Osceola and Lake Country. Applications are accepted between 8am – 4pm Monday to Friday, except for Bank Holidays. The current fee for a marriage licence is $93.50 Orange County, $103.50 Osceola County, $93.50 Lake Country payable by cash, Visa or MasterCard (at Orange and Osceola). Lake County is cash only. Distance is approximately 20 minutes from International Drive / 35 minutes from Lake Buena Vista. Please do not worry; your wedding planner will go through the procedure of this very simply procedure once you have arrived. The marriage licence is valid for 60 days from the day of issue; you will be given your wedding license prior to leaving the courthouse. You should give the wedding license to the Notary or Minister on the day of your wedding. The Notary or Minister will then be responsible for posting the Marriage licence back to the courthouse to have it validated. This will become the official Marriage Certificate. This process should take between 4 – 6 weeks and will be posted directly back to the couple’s home address. If you require certified copies of your marriage license, each additional copy is $3.00 per copy. Give this money to the Notary/Minister on the day of your wedding. 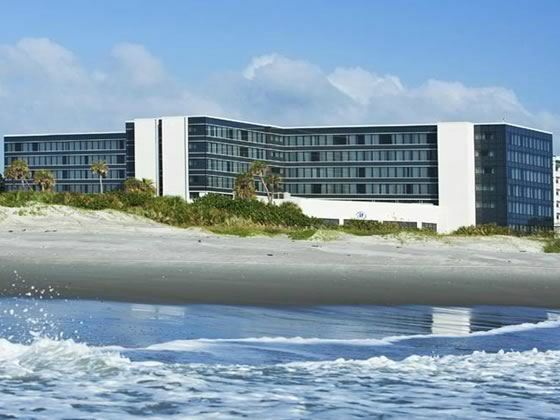 These are three of our favourite hotels in Cocoa Beach which are ideal for a wedding or honeymoon, but there are plenty of other great options available to choose from - please call us for details. 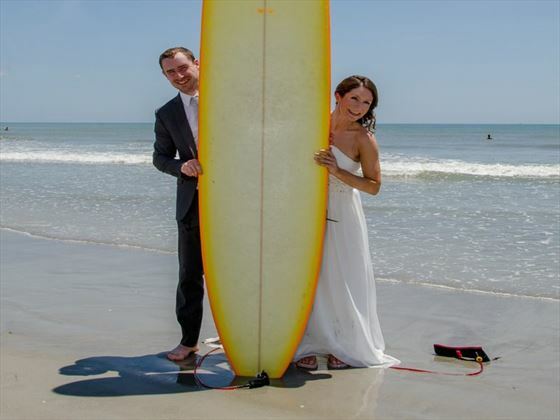 Why book your Cocoa Beach Wedding with American Sky?